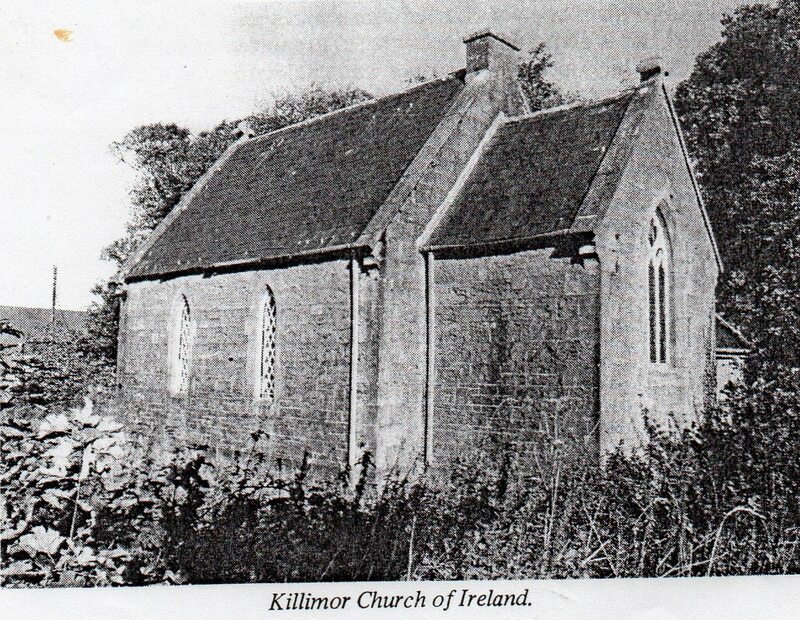 In 1834 Lewis gave the number of Protestants in Killimor Bologue as seventy eight, and at that stage, Killimor Parish (for Protestant purposes) was a Vicarage in the Diocese of Clonfert, forming part of the Union of Dononaughta. The book Inspiring Stones denotes that within the union, there was a Chapel of Ease at Eyrecourt Castle, and Divine Service was also held in a schoolhouse in the parish of Killimorbologue. The Ordnance Survey Map 1838, places a School House and a Petty Sessions Court House quite close to where Trinity Church was later sited. Perhaps the divine service was held in this School House. In order to serve the number of Protestants in the Parish at that time, Trinity Church was constructed. It is situated on the N65 road between Portumna and Loughrea at the end of the village of Killimor, and in its day was one of the smallest and most picturesque in the Diocese, being a Chapel-of-Ease to Eyrecourt church. ‘Built in a conspicuous place in the village, on a site granted by the Right Hon. Lord Dunsandle, (who in addition, generously contributed £15 towards its erection), it stands a pleasing monument of what can be done by the prayerful and harmonious action of a pastor and his people.In this same article the Church is described as being of Gothic design, built of the dark stone of the locality, ‘with quoins and dressings of the white limestone of Ballinasloe’. The benches were simple and the roof open-stained and varnished. The chancel window was filled with stained glass which showed an open Bible and appropriate text, “The Lord is my Light”. The building of the Church was a labour of love with time, services and money all freely given. Messrs. Sanderson, Hardy and Watson are mentioned as working ‘nobly and successfully’ and worthy of note. Trinity Church, it appears, was opened on Wednesday 21st January, 1863, by the Bishop (un-named), who recited the Litany and afterwards preached an appropriate and touching sermon. His Lordship was listened to throughout with ‘intense interest and gratification’. The Service commenced with the singing of the 100th Psalm; Morning Service was read by Rev. T.H. Cross and the Lesson for the day was read by the Venerable The Archdeacon of Clonfert. After the opening ceremony a collection was made in aid of the building fund; the contribution, including that from people unable to attend, amounted to almost £17. The Bishop and clergy were then entertained by J.P. Watson, Esq., at Stowlin House. A letter from Dr. Raymond Refaussé, Librarian and Archivist in the Representative Church Body (RCB), Churchtown, Dublin, indicates that no records from Killimor have been transferred to the Library. Since Killimor was united with Dononaughta (Eyrecourt) it may not have had separate registers, and details of baptisms, marriages and burials may have been entered in the Eyrecourt registers. The Eyrecourt registers (baptisms 1738-1876, marriages 1738-1861 and burials 1738-1869) were destroyed in the fire in the Public Record Office of Ireland in 1922, and no copies of them are known to exist. Similarly no separate list of clergy for Killimor is available. Dr. Refaussé writes ‘we have no separate list of clergy for Killimor and I assume that the Church was served by the Clergy of Eyrecourt’. A search by the Revd. Alan Nevin through existing records in The Rectory, Banagher, also yielded negative results. Norman Sinclair, Aughrim, provided the names of some clergymen who officiated at services in Trinity Church. They include Rev. Graham, Rev. Aldridge, Rev. Ford and Rev. McLarney. Norman also supplied names of families, and names of members of the RIC who worshipped at Trinity Church. Among the names are: Sub-Constable Henry Bowen Moriarty, (RIC, circa 1879) together with Jane and Margaret Emily Moriarty; Head-Constable Francis Gannon (RIC, about 1880) his wife Ellen and daughter Frances; Police Sergeant Daniel Clements (RIC, circa 1885) his wife Margaret and daughter Margaret Anne; Daniel Thompson Noble Clements was also a police sergeant in the RIC around 1888; The Doonan family, Johnston Doonan, (RIC, circa 1890) Annie and Alice Mary Maud Doonan; Isaac William Heatley and Lizzie Heatley (RIC, circa 1890); Thomas Shaw (RIC, circa 1900), Jane Florence Shaw and Deborah Shaw. Other families who attended service in Trinity Church were: Richard Johnston, Harriet Johnston and Arthur Johnston, who were farmers in the area about 1888 and 1889; Alfred Borraine Persse, Gladys Persse and Geraldine Florence Persse, Ormond View, Ballycrissane, 1899; Henry Edwin Thomas Sparling, Norah Maud Sparling and Matilda Sparling who were merchants in Killimor circa 1891; William Arthur Carr, who was a coachman in Hearnesbrook around 1898, together with George Keith and Mary Carr. Despite the lack of official records, memories survive of services being held in Trinity Church at 8.30 am and 3pm on Sundays. As numbers dwindled, service was celebrated just once a month. During service, which lasted approximately one hour, prayers were recited, hymns sung, a sermon delivered and communion distributed. Communion consisted of ordinary bread, blessed and broken and placed on a silver plate. A silver cup contained the wine. The plate and the cup as well as lighted candles were put on the communion table which was covered with a white cloth and situated in front of the altar. During the last hymn a special plate was passed around for the collection – this money was used for the upkeep of the church. This small and compact Church contained pews, hymn-books, an organ and a lectern on which stood an ornate eagle. As far as is known no marriages or funeral services took place in Trinity Church. One burial is believed to have taken place in the church grounds, the body later being exhumed and interred elsewhere. Two of the Horsman children from Heathlawn were baptised in the church by Archdeacon Burrowes in 1954 and 1961. With the decline of Church of Ireland families in the area, it was no longer feasible to keep the Church open. After religious services were discontinued in the Church, the building was used for some years as a sub-office by Bank of Ireland, Portumna. The bank closed this particular facility circa 1988. The Church building was also used as a venue for participants in Fleadh Cheoil, Co. na Gaillimhe, in the years 1987, 1988 and 1993.The Representative Church Body eventually sold the premises to Brendan Lynch on 23rd November 1992.